Time to flip the calendar and bring up a shiny new month. August has been a busy month with celebrations and frustrations and the inevitable birthday blues. I will be glad to turn the page and see the promise of September. Pristine 2007 calendars are arriving in the mail, along with Christmas gift and card catalogs. It’s downhill to the holidays from here. Every end-of-summer I look forward to the next few months as a time of new beginnings and re-energized days. But Fall always just zooms by and suddenly it is Winter and the rain and wind arrive to make staying in the house more appealing. Now on these beautiful pre-autumn days, the Gorge beckons and I want to be out every day soaking up the beauty of Oregon. One of my last-days-of-summer activities has always been the State Fair and today Phil and I are taking two of his clients (Steve and John) to Salem for a day of fun and junk food. Steve is in a wheelchair and John uses a walker so our progress may be slow. We’ll take their handi-van that is outfitted with a chair lift. It should be a great adventure for all of us. It is SNOWING at Timberline!! Forget that bit about a Touch of Fall. We are having a Prelude to Winter. Pouring down rain here at The Hideaway and dropped into the 40s last night. Back to blankets on the bed and closed windows at night. And the enticements of indoor activities like reading and knitting and watching tennis on TV. Retooling my Autumn Activity Plans. I did not get offered the part-time job at the knit shop that I thought would feed my habit. Just as well as it would have been a long commute and a lure to spend money I can’t afford. Princess did not make the cut for the Animal Assisted Therapy Program. Just as well as it would have been a long commute and put quite a bit of pressure on her. Like me, she likes her lazy days. More time to doodle and snooze. Still planning on taking the Oregon Tax Law course and sitting for the exam to get my Oregon Tax License in anticipation of maybe doing taxes again in 2007. The class is a 12-week commitment. Every month, I have my three get-togethers: Book Club, Yarn Yoga, and Quilt Party. Plus three hikes in The Gorge that I will be leading for Friends of the Gorge in September and October. I also attend the First Friday Potlucks sponsored by Living Earth Gatherings. Around those activities will be Harvest Festivals, the last of Farmer’s Markets, The Northwest Quilting Expo, family birthday celebrations, a Joan Baez concert, and other as yet unknown events that sound interesting. Somewhere in there, I hope to finish a little-boy-size dog-themed quilt for Brayden, my sister’s great grandson. I think that makes him my great grand nephew. Or some such. A cutie pie who is walking at 10 months. He turns one in mid-October so I better get started! Windy and I have some home improvement projects on deck for the Labor Day weekend. 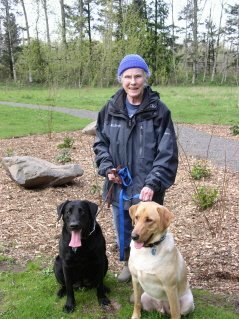 And I will be attending the Living Earth Workshop/Retreat with Joanna Macy. She is an icon and I have admired her philosophy for several years now since being introduced to her writing by my Osceola friend Larry. The geraniums (a little worse for the wear) have been replanted and reinstalled on the porch railing and life goes on. Too chilly to sit out there this morning. Tilted lampshades, pictures hanging crooked on the wall, curtains slightly askew and blowing out open screenless windows. Walking the dogs on these almost-autumn evenings as dusk deepens provides glimpses into people’s lives and living rooms. If I go around 7:30 almost all the TV sets are tuned to Jeopardy/Wheel of Fortune. A few hardy souls are still sitting out on porches and call out hello as we pass. The baby of a few months ago now has a word for Princess – “wow-wow.” The pit bull puppy around the corner is almost full-grown. Flowers hopefully planted in the spring have bloomed and died. The cycle of nature continues and the cycle of lives is revealed through the windows of the homes I pass. It’s the end of summer and parents are getting into “school night” mode, bringing the kids in earlier from their play. Even before the Equinox makes it official, Fall has come to Wood Village. The streets are already littered with dead leaves and there is a hint of rain. The wind has picked up tonight and reminds me winter will follow soon enough. When I get home, I close the shades and draw the curtains, keeping my life private and secret from the eyes of strangers passing by. 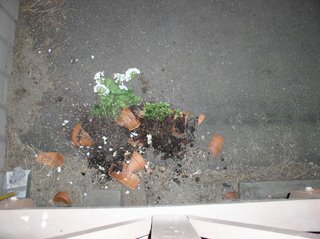 Well my little porch garden that brought me so much joy fell victim to vandalism last night. I came out to find the pots crashed to the driveway below the railing. 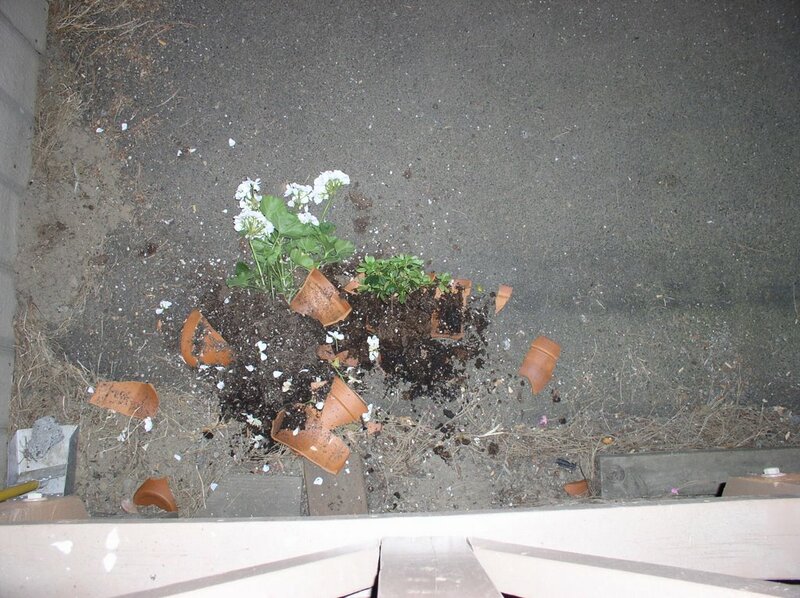 Shards of broken clay pots, bits of soil, stems, roots and petals all scattered about. One of my round rocks from Osceola was apparently the weapon. It didn’t break, but lay scraped and bruised out by the shed. This might have happened in San Francisco. And in fact, I had things stolen off my porch there, pot and all. I had to race out in the morning and grab the paper before a passerby took it. But then I moved away and lived in safer places. I was lulled and complacent so this was a big wake-up call for me as I had felt safe here. The dogs were in the house with me (they didn’t bark??? ), and the cars are unharmed so in that regard I am relieved. But I am sad to see the carnage and now I have a mess to clean up this morning. These were scraggly little geraniums that I rescued from the back of a plant sale and nurtured into bright thriving blooming beauties. I am very sad. The cast of light this Sunday morning reminds me that the end of summer is around the corner. Despite the ninety degree heat of yesterday and the same prediction for today, there is still the feel of Fall in the air. Every year, somewhere around my birthday, this feeling comes over me. Sadness that summer is ending, but excitement about my “new year” that starts with Labor Day. A throw-back, I think, from the back-to-school days of my youth. Out on the golf course yesterday (at the Tournament that was my birthday gift from Andy), there were yellow leaves littering the ground. Here in Wood Village they have already begun to pile up against my fence. No burning allowed here, so the leaves will be stuffed into the Yard Waste Recycling bin. Of course, the pine trees don’t drop leaves but they contribute with hundreds of cones and powdery pollen that coats the plants below. The geraniums are in full bloom and the porch is awash with color. My pot and tub gardening has created an inviting and peaceful place to read or knit. The flowers make a privacy screen and I can hide out there and watch life go by. The yard itself is easy maintenance with only a bit of watering and an occasional pass with the little push mower required. The welcome strip outside the fence that Phil planted for Mother’s Day is bright with wildflowers that are thriving. Soon the harvest festivals will begin and we will no doubt attend a few. One of my favorites is the Fruit Loop that travels through the orchards on the back roads near Hood River for autumn’s bounty of apples and pears. Another is out on Sauvie Island (where Andy and Laura held their Wedding Reception). The Farmer’s Markets continue through September and into October with more and more root vegetables available. And apples, apples, apples everywhere. Blackberries abound on all the hiking paths and we will go out with a bucket next week. A memory from many years ago of blackberry picking with my brown and white Brittany, Taffy. She came back with all her white spots stained purple! Princess may get some blotches, but they won’t show in her black coat. Buddy will no doubt look tie-dyed! Today I’ll pack up more book orders to mail tomorrow, read the Sunday paper, watch Meet the Press, take the dogs out for a mini-adventure, and run by the Library to pick a book I requested. And get ready for the busy week that is coming up. 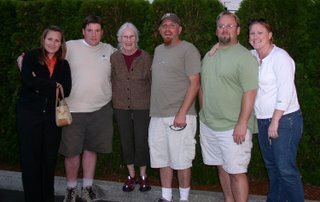 Left to right: Laura, Andy, Me (standing on the curb), Phil, Chris, Windy. Not shown: Scott in Little Rock. Note: Through the wonders of technology, Chris will be able to superimpose Scott at a later date. People laugh at the name, but it is no sillier than names of other craft groups or book clubs. Once a month knit and crochet enthusiasts gather together on Monday evening at the local Craft Warehouse. It’s a chance to join in lively conversation with other crafters and work on my current project or begin a new one. This is a fun-filled event that provides uninterrupted time for my project and a chance to meet like-minded women. We share yarn experiences, talk about new products, exchange patterns, provide assistance to beginners, get help with our own challenges, have feedback on our work. The evening also features Show ‘n’ Tell and an opportunity to show off your finished items. Ages range from 10 to 80 but all are women. Each month we have a challenge swatch that provides a chance to build a library of interesting and unusual stitch patterns. If you complete the swatch, your name is entered in a drawing to win a door prize. Also we all get a coupon for a discount on yarn or knitting products. I will go tonight and report on the Wedding Afghans which I completed in the car on the way to the Reception Friday night. Last spring the group helped me decide on the lace and cable pattern I used from several samples I took to the meeting. They will be glad to hear the projects are finished. 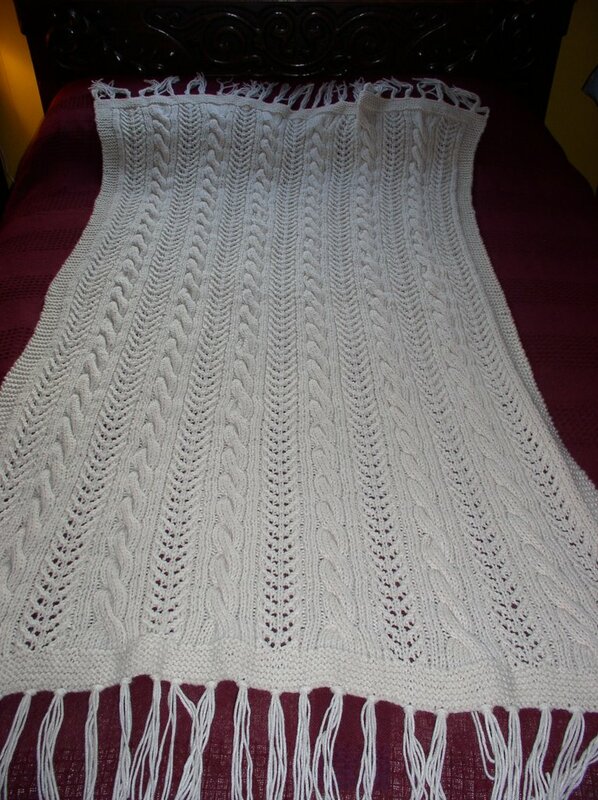 I will also take the Sixteen Color Vest I started in the Fall of 2003 and have never finished. 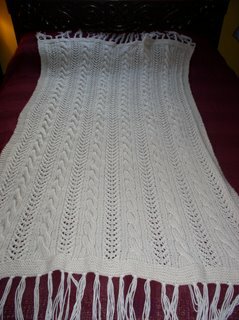 The knitting is mostly done, all that remains is to weave in the ends (there are many!) and sew the seams. This activity is one of my favorites and another advantage of living in a town where such a fun and creative get-together is offered. Eighteen thousand people turned out for the third largest mass bike ride in the country and among them were Windy, Chris and Phil. Riders of all sizes, colors, and ages on a wide variety of bikes, trikes, and unicycles. I was there, one of the few on foot, walking across the Steel Bridge from the Rose Quarter and meeting them at the finish line. The route took them back and forth over the Willamette River on these bridges (north to south): St. Johns, Fremont, Broadway, Steel, Burnside, Morrison, Hawthorne, Marquam, Ross Island, and Sellwood. The actual route wandered back and forth so the ride was not exactly in that order. Entrants chose different lengths: 6 bridges, 8 bridges, or the killer full loop of 10 bridges. The troops rode the full loop – 36 miles round trip. This was a fun ride, a fund-raiser for Providence Hospital (from the entry fees). No timed race, no prizes. Just a banana and a bottle of water for finishing. Down Home Musings Is a Book! Down Home Musings is now a book! Composed of many of the Blog entries you read during the summer of 2005, with other pieces from my journals plus new essays never before published. Sometimes sad, now and then poignant, often hilarious, occasionally meditative and even provocative, Musings will make you laugh and reminisce and maybe long for the good old days and another quieter, simpler way of life. The book is $11.95 plus $2.00 for shipping and handling if you order a personalized autographed copy direct from me. E-mail hideaway43@verizon.net for an order form. You can also order online at www.iuniverse.com/bookstore But no autograph! The thunderstorm I mentioned two days ago arrived, and with it a number of lightning strikes that started over forty forest fires in the Mt. Hood Wilderness Area. Over 260 firefighters are on the mountain today attempting to contain those blazes. Fortunately none are threatening any dwellings. However, search and rescue teams are combing the area looking for campers who might be in the back country away from roads and out of reach of communication. Highway 26 to Government Camp is closed as well as sections of 35. Traffic is being routed back to Portland and up 84 to Hood River. (About an eighty mile detour!) Helicopters with megaphones fly over areas known to have campsites. Fire planes carrying loads of water take off and land at the Troutdale airport near my house. Air activity combined with thick smoke in The Gorge is a dramatic reminder of the summer danger in this tinder dry weather. Much as I like the freedom from the heavy rains of the winter, the opposite dry spell has brought with it devastating mayhem in the woods. Last summer I wrote of how I dreaded fire when I owned the place on Wild Pig Ridge in the Mendocino National Forest in California. For twelve summers, I worried every day that fire would reach my place. The summer I was living up there, I had to evacuate once and I learned what I would take in an emergency. My purse and my pets. Forest management practices, controlled burns, natural cleansing are all topics for heated debate here in the Pacific Northwest. Opinions vary widely. One thing is clear…once started, fire is a dangerous and shifty enemy and those who volunteer to fight it are brave and stalwart heroes. The last page was turned and the book John Adams was closed late Saturday night. What a read. I thoroughly enjoyed it. And it was so nice to have that big thick book sitting there to pick up any slack in the day, and find a use for minutes free from chores. Sunday I ventured to Borders (the nearest bookstore) and brought home another book and now I am stuck with a mediocre mystery, Lost Lake by Philip Margolin. Anxiously awaiting my rise to the top of the waiting list for several books at the Library. The weather has changed in the last hour. The sky has clouded over and the wind has come up. Thunderstorms are brewing over the Cascades and there will be rain here at the foot of Mt. Hood before long. The cast of the afternoon light is different, moving toward the look of after-school afternoons on Fall days. Parents have called their kids home for dinner. The dogs and I are back from our walks and settling in for the evening’s television. It’s Monday, a day I used to dread when I was working. Mostly because it was so far away from Friday. Now I rather like it as the neighbors go back to work and it is quiet and peaceful here during the day. It’s pleasant here at The Hideaway on these marvelous cool Pacific Northwest days. The best weather since I’ve lived here. But it is dry and there is forest fire danger so rain tonight will be welcomed by drooping plants and firefighters. Last week, three days in a row, I came out to the kitchen to make the coffee in the morning and was greeted by a frog sitting in the dish drainer tray. Now I couldn’t mark it with nail polish like I did the turtles that visited me at Terrapin Station, so I don’t know if it was three frogs or one frog three times. I knew I saved all those cottage cheese cartons for a reason. Perfect for amphibian relocation. So I toted the little fellow outside and released him in the dog-free part of the yard. I am now closing the window between the kitchen and the deck every night. Interesting that even here, in a major urban area, I can still find wildlife loose in the house. Of course, we have spiders. And for awhile last spring, ants marched through. And every night on the dog walk route we see snakes. And then we have the kamikaze flies on the porch that spiral in a decreasing circle until they stick on the fly strip dangling from the beam. There’s lots of action overhead. Ducks. Geese. Eagles. Osprey. Blue Herons. Crows. Gulls. And underground, moles are making labyrinths and mazes in the yard with giant piles of dirt marking their progress. Feral cats roam the fields across the road and sometimes come over to visit the little platform outside Windy’s bedroom window to say hello to Lenny. Who would have thought Wood Village Hideaway would be a Wildlife Preserve! Ten years ago this day, I lay on the operating table at Kaiser Permanente Hospital in San Francisco, going “under the knife” to repair the damage done by years of unhealthy living and bad habits. I had walked very close to the edge, and a series of TIAs (Transient Ischemic Attacks) had sent me to the eye doctor as I thought I was going blind. That wonderfully perceptive man sent me immediately to the emergency room where they immediately paged Dr. Okuhn and my surgical journey began. There was great fear of contaminated blood in San Francisco at that time, so surgery was postponed while I gave a quantity of my own blood equal to my entire body’s worth of fluid prior to the surgery. Two surgeries were performed, one on Friday August 2nd and one on Monday August 5th, each taking many hours. I was in Intensive Care for several days and my hospital stay was over three weeks altogether. I arrived home at the Cottage at Ocean Beach on my 59th birthday. Alive and with good prospects for a new life. Recovery took months and started one tiny step at a time…first across the room, then onto the porch, then down the steps, then out to the street, then down to the corner, then across Lincoln Way to Golden Gate Park, then down the path a few feet, then a few feet farther. The following May I walked over 7.5 miles in the Bay to Breakers, coming in somewhere in the middle of a pack of hundreds. I look back at the ten intervening years with gratitude for the life extension I was granted. Every day is special to me now as I came so close to checking out back then. I am at this time healthier than I have ever been. Weight, blood pressure, cholesterol levels all where they should be. Energy up, malaise down. The recent move to the Northwest has energized me and given me new avenues to pursue. I am close to my children, I have a book being published, I took my dream trip to Alaska, my son is happily married. Life is good and I look forward to turning 69 in just a few weeks. My undying gratitude goes to Dr. Okuhn and the other doctors at Kaiser that gave me this gift. A quiet morning on Elderberry Circle and we are all being lazy. The dogs are worn out from their romp in the park last night, Lenny is zoned on his birthday catnip, and I am crashed on the couch enjoying not doing anything except read and doze. The temp has dropped sharply from the days of our heat wave and it is in the low 50’s as I write this. Overcast and uninviting outside. Perfect for decompressing from all the busyness of the last three months. Working… Alaska… working… Colorado… visitors… dead tree… picnics… other events. More activity than a year in Osceola! Now August will be more peaceful with only Andy and Laura’s Wedding Reception on the calendar. One long-time friend will visit for that event. Otherwise…I am left with some free time to get my book out, finish a knitting project, start a quilting project, finish John Adams, start writing my second book, take some long hikes in The Gorge, and get back to routines and a regular eating and sleeping schedule. Neighbors from the next block came last night with a pick-up truck and loaded all the firewood from the dead tree. They have a wood stove and were grateful for what amounted to about a cord of wood. 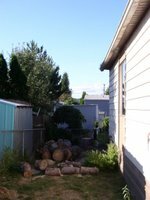 So the back corner is empty except for the stump that remains. A Family Work Day is planned for Saturday with more clean-up and possibly building a back porch/deck. Life goes on in Wood Village. The tree is history and only a pile of firewood remains. It is a bit sad to watch the natural demise. The tree was crowded and the roots had nowhere to go. It was here before the park was built and the homes moved in around it. Sunshine streams in my bedroom window and that will be nice in the dreary winter that will come later in the year. For now, I am glad the heat wave is over. It was interesting that no birds were nesting in it, but there are many in the green specimen still standing.